One thing puzzled me about Super Mario Land a bit at first: its length. The Gameboy was designed as ideally a platform for casual play, something to occupy your attention while you waited for the school bus. Its killer app was, after all, Tetris. But at half an hour or more per play session, SML doesn’t really fit that model. On the other hand, with a half hour or so of play in the entire game (and no save feature! ), it doesn’t fit the model of a “core” game either. What sort of experience were they aiming for, anyway? When it came to me, the answer was obvious. A half-hour of maximum total gameplay in a single session fits comfortably within the expected parameters of a coin-op arcade game. In 1989, coin-op was still the dominant form, and it would have been taken for granted that console titles are imitations of coin-op games, even when they weren’t direct adaptations. This also makes sense of the “Continue” mechanic, which simulates inserting another quarter. Today’s designers of games on the level and scale of Super Mario Land are writing them in Flash and releasing them for free on the web. I suspect that today’s core games are influencing these works in ways that will eventually seem as odd as the coin-op influence in early console games, but only time will give us the perspective to know how. Rescuing Princess Daisy required just one more solid thumbwrecking play session. I managed to get most of the way through World 4 in the same game that I encountered it for the first time, but needed two continues to pass the two-stage end boss. “Continues” in this game are earned with points, and, when used, restart you at the beginning of your current level with three lives. Since I couldn’t beat the final boss with more than ten lives left on the initial sally, I was rather surprised at pulling through in the continues. But ideally each death teaches you a little more about what to avoid. World 4 has one of the best bonus rooms ever. It’s a screen that fits the usual parameters of the Super Mario Brothers-style bonus room, but is otherwise completely filled with coins. This isn’t really all that impressive as a reward — it takes 100 coins to earn an extra life, and if you could collect all those coins, they’d be worth two lives and some change. You can get more than that from the bonus game between levels. But the bonus game isn’t nearly as delightful as suddenly finding yourself completely surrounded by coins. It strikes me that part of the genius behind the early platform games was using motion to create an impression of a continuous, fluid world in spite of the system’s graphical limitations, compensating for low spatial resolution by taking advantage of the high resolution in time. A still image of Mario looks blocky and pixellated, but his trajectory looks like a smooth, graceful parabolic arc. Sonic the Hedgehog would later employ the same principle in a different way, emphasizing both speed and speed differences. So, what do you play when you’re on the road? Handheld games, of course. The Nintendo Gameboy, and the Gameboy Advance that I later bought to replace it, are the only handheld consoles I’ve ever owned, as well as the only Nintendo consoles. I bought my Gameboy mainly to play The Legend of Zelda: Link’s Awakening, considered by some not just to be the best game for that platform, but one of the finest games written for any platform at the time. But if you’re going to buy a Nintendo console, you’re almost required to get at least one Mario title for it. In fact, I think Super Mario Land may have been bundled with the Gameboy I bought. The fact that I didn’t finish it when I first played it back in the 90’s is mainly due to its complete lack of any way to save your progress. Not even level codes are provided. It compensates for this somewhat by being short. The game consists of four “worlds”, each consisting of three levels with a boss fight at the end of the third (although, interestingly, the bosses allow the player the option of slipping past them instead of fighting them). After a little practice, I find it takes me about 8 minutes to get through the first world, so a skilled player can probably play through the entire game in under half an hour. To someone struggling to get though world 3 for the first time, the first two worlds form a sort of warm-up, where the challenge isn’t to survive but rather to pick up as many extra lives as you can in preparation for the hard part. A lot of games these days have a sort of “survive, then perfect” pattern, where you can go back to earlier levels and try to improve your performance in order to earn special rewards, such as unlockables. Viewed from this perspective, the main difference here is that it’s not a choice. You have to go back to world 1 every so often, when you run out of lives. The gameplay is based closely on that of Super Mario Brothers for the NES, but with various innovations, such as new monsters, a really distinct boss at the end of each world, and at least one level that’s a scrolling shoot-’em-up rather than a platformer. Still, despite this, it mostly feels like a smaller, simpler version of SMB. Indeed, in some ways it seems like a SMB knockoff, with all of the names changed but the premise kept intact. Princess Daisy, SML‘s damsel in distress, is functionally equivalent to Princess Toadstool/Peach. Only by reading the manual do I know that SML‘s chibibos are not goombas. I wasn’t familiar enough with the Mario mythos to notice this back in the day — possibly it wasn’t as entrenched back then. I’m under the impression that a lot of early Gameboy titles were reduced versions of NES titles, which is strange, since, as far as I can tell, the Gameboy was actually a more powerful machine than the NES in every respect other than graphics (and possibly sound). But the reduction in graphics is very significant: lower resolution, four-shade greyscale instead of color, and, worst of all, the slow response time of LCD technology circa 1989. It was a rare Gameboy game that actually looked better than the NES game on which it was based — Link’s Awakening being one example. SML has the handicap of continually scrolling, which shows that LCD display at its worst. It’s somewhat better on a GBA than it was on the original Gameboy, but I still find myself occasionally missing crucial jumps because I can’t see what I’m doing well enough. I keep returning to the question of how to play games for optimal enjoyment. Is it better to play in a single obsessive weekend-consuming burst, or spread it out into smaller sessions? I’ve become convinced that the latter is better for RPGs, which become tiresome when played too long. For puzzle games, I’m not so sure which approach is actually better, but I do know that I always want to play them in obsessive burst mode. I played through the first two DROD games that way. But there are demands on my time just now, and I haven’t had a weekend to devote to The City Beneath. In fact, I’m going to have to put it aside for a week. I’m going to be out of town, without access to the computer I’ve been playing it on. May the anticipation of returning to it make it sweeter. I’ll try to do some posts during the week all the same, but probably not about DROD. For what it’s worth, I think I’m more than halfway through the game by now, as I’m well past the second of the city’s three great gates. (The first is at the very beginning. It’s not clear to me yet how much content there is after the third.) The story has returned me to the surface for the second time, and I have just started encountering the mysterious Gel, a previously unseen tar variant. I’ve come to really like the improvements that have been made to the DROD user interface. Basically, each episode makes more information available. For example, one of the basic mechanisms in DROD is orbs that open, close, or toggle gates when struck. The City Beneath also has pressure plates that do the same when trod on (which means you can trigger them from a distance by inducing monsters to walk over them). But the orbs and pressure plates are not necessarily near the gates they affect. In the original DROD, if there were multiple orbs in a room, the only way to know what they did was to try them out, which you could only do for the ones that are acessible at any moment. Well, ever since Journey to Rooted Hold, you can click on these controls to highlight the doors they affect, in colors indicating whether it opens, closes, or toggles each door. I didn’t use this feature much when I learned about it, but it’s become a very big deal. 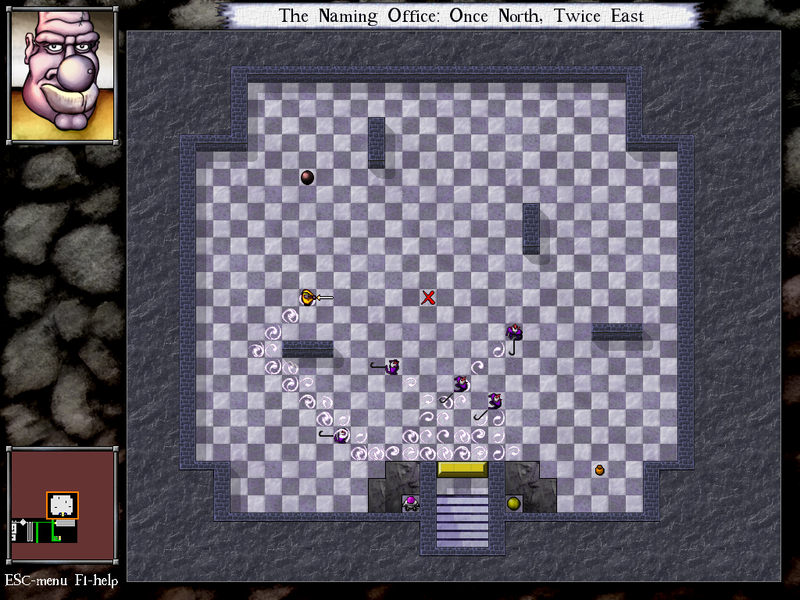 One of the basic DROD room patterns is making the player hit a series of checkpoints in a specific order by giving each an orb that unlocks the door to the next. With the new UI, I can know in advance the order I’ll have to hit them in, and plan accordingly. Even in rooms where all the orbs are accessible from the beginning, it’s nice to not have to try them all out (and possibly render the puzzle unsolvable in the process because you let the cockroaches out too early or something). Once they implemented this click-to-highlight system, the designers started using it in various other ways, such as clicking on an Evil Eye to show its line of sight, or (new in The City Beneath) clicking on a bomb to highlight the area that will be affected by its blast. This was never secret information. All bombs in the game have the same blast radius. So displaying that radius on demand is just a convenience. You know something? Conveniences are nice. I actually didn’t notice most of these features in Journey to Rooted Hold, which wasn’t as aggressive about pointing them out as the new episode, but there was one enhancement that was hard to not notice: it added a clock to the screen whenever there was a timed event pending. Mainly this meant timing the spawn cycle of Roach Queens and Tar Mothers, both of which cause new stuff to appear every 30 turns. Knowing exaclty how soon that’s going to happen is often crucial, and it was easy to lose track when playing the original DROD. 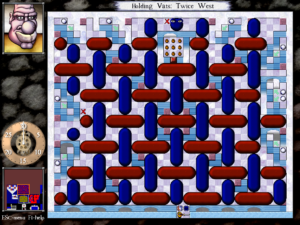 The general principle here is that providing easy access to crucial information helps the player, by making the process of solving the puzzles easier, but doesn’t actually make the puzzle itself easier. A subtle distinction, perhaps, but an important one, and one that’s illuminated by my recent experiences with Roberta Williams’ Time Zone. Williams chose to make things inconvenient for the player, making you reload saves and do things over again because you used the wrong weapon or brought the wrong selection of objects into the endgame. She chose this, I think, because she was trying to create a difficult game, and the understanding of the time did not differentiate between difficulty in solving a game and difficulty in playing it. The designers of DROD have a better idea of what their gameplay is about. It’s not about keeping secrets from the player. It’s about applying known rules in complex and novel ways. It’s interesting, then, that they still choose to retain the possibility of hiding information in some ways. Let me explain: I’ve just reached the point in The City Beneath where the Living Tar makes its appearance. Living Tar, and its variant Awakened Mud, form DROD‘s version of ooze monsters. In its simplest state, tarstuff (the word applies to both forms) lies in inert pools covering multiple tiles, not crossable and only partially vulnerable to attack: Tar is invlunerable on its convex corners, while Mud is invulnerable everywhere but its corners. Either must be cleared away one tile at a time. Now, until cleared, tarstuff conceals any terrain features in the tiles it occupies, including orbs, pressure plates, gates, and even walls. This is significant information-hiding. 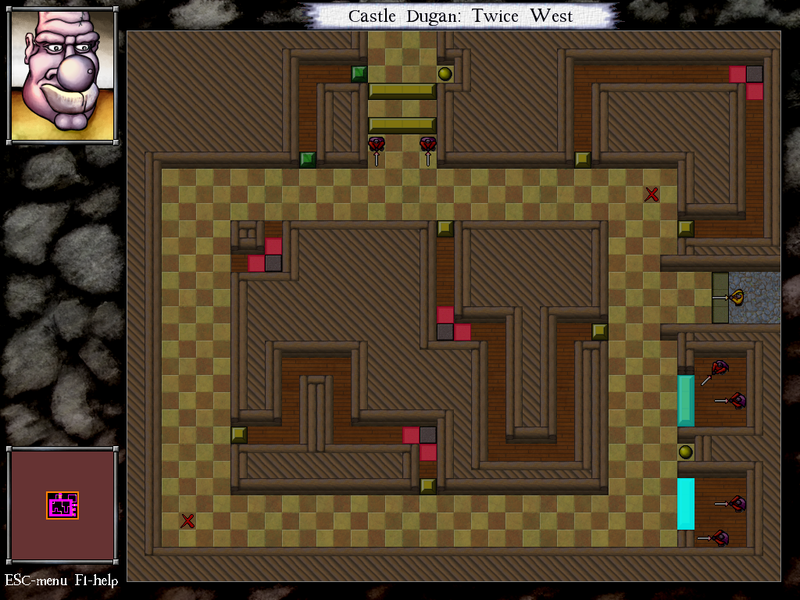 The original King Dugan’s Dungeon had some puzzles that relied on tarstuff’s concealing properties. For example, there was a maze completely covered in tar, which you had to cut carefully lest you wind up with an invulnerable tar corner blocking the path you needed to take. This isn’t really in the DROD style as I’ve described it above, but it’s typical for the first game in a series to have a few klunkers. The City Beneath provides a way to see what’s under tarstuff, but it isn’t a user-interface feature like the other things I’ve been describing. Rather, there’s an in-game “token”, a special tile type that effectively gives Beethro X-ray vision when activated, rendering all tarstuff translucent. I can think of three possible reasons why tarstuff visibility isn’t handled through a simple click like the other new information features. 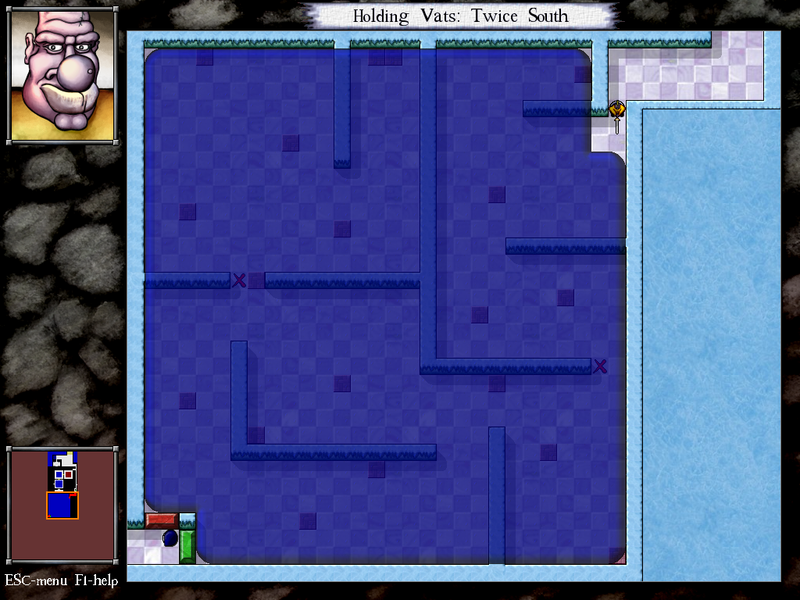 First, it could be that there will at some later point be puzzles that rely on concealing information with tarstuff. I hope this isn’t the case, because it’s difficult to imagine the result being anything more than a guessing-game, and I think the DROD designers are past that now. Second, it could be that the designers wanted to preserve the ability to play levels created in the older engines without drastically altering the play experience. I don’t know that that’s a great priority for them, though: surely some of those old levels are drastically altered by the ability to click on an orb to see what it does. Third, it could just be the difficulty of creating a user interface to deal with it reasonably. If you click on tarstuff to see under it, and you click on orbs to see what they affect, how do you see what’s affected by an orb concealed by tarstuff? Let’s make one thing clear: DROD is fundamentally a bag of puzzle-rooms. It’s got aspects of narrative and world-building, but they exist as a frame for the puzzles, and are wholly subordinate to them — for example, the gameworld is full of gates that only open after all the monsters in the room have been killed, even in areas that aren’t in dungeons. This makes no sense in the world or the story, but the game trumps them both. Still, the story isn’t just appended to the game (in this episode, anyway). The story complements the game, providing a rationale for game elements. For example, I’ve just been through a part where Beethro briefly returns to the kingdom of Dugandy. Through the machinations of the Empire’s agents, Beethro is a wanted man, a suspected traitor to his own king. So, sneaking into a guardhouse (a rare stealth segment — Beethro doesn’t want to kill his own countrymen), he steals a guard’s uniform to use as a disguise. It turns out to be a very successful disguise indeed: while he has it on, the monsters in the dungeons won’t attack him first. Once Beethro makes an attack, everything charges. This temporary change to the basic rules of the game is the basis for a set of puzzle rooms, ones that can only be solved by not initiating combat immediately. Was the puzzle sequence inspired by the story, or was the story invented as an explanation for the puzzles? Probably a little of both, but the game gets more out of it than the story does. Good advice or bad? All I can say is that it seems to have worked pretty well here. 1. ↑ The most basic monsters in DROD are the giant cockroaches, which just charge at you in a straight line. Roach queens are roach generators. They flee before Beethro and create new cockroaches after every 30 moves. Having played the oldest games on the Stack, it’s meet that we now continue with the newest: the first game on the Stack to be released after I started this blog. 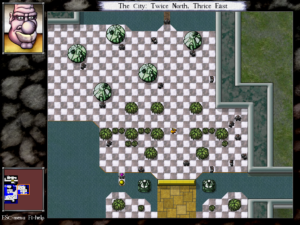 DROD: The City Beneath is a game I’ve been looking forward to. I suppose I’ll have to explain the DROD phenomenon a little, because it’s way too indy to attract any significant media attention. Known to connoisseurs but not sold in stores. The word “cult” probably belongs in here somewhere. 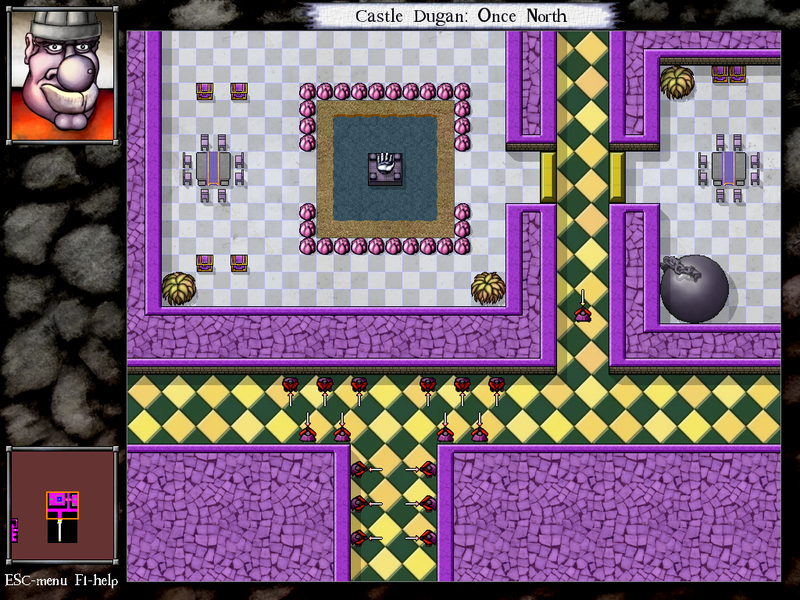 Originally known as Deadly Rooms of Death, it’s a turn-based puzzle game in the dungeon-crawl idiom, its gameplay somewhere between Gauntlet and Sokoban. The goal is simple: kill all the monsters. A single blow from your Really Big Sword will destroy any living thing in the square it touches. The controls are also simple: use the arrow keys to move one square in any direction, and the “Q” and “W” keys to rotate 45 degrees, swinging your Really Big Sword 1Yes, it has to be capitalized like that. Be grateful I have enough self-control to refrain from adding a trademark symbol. as you do so. It uses these two simple things to create complex puzzles. 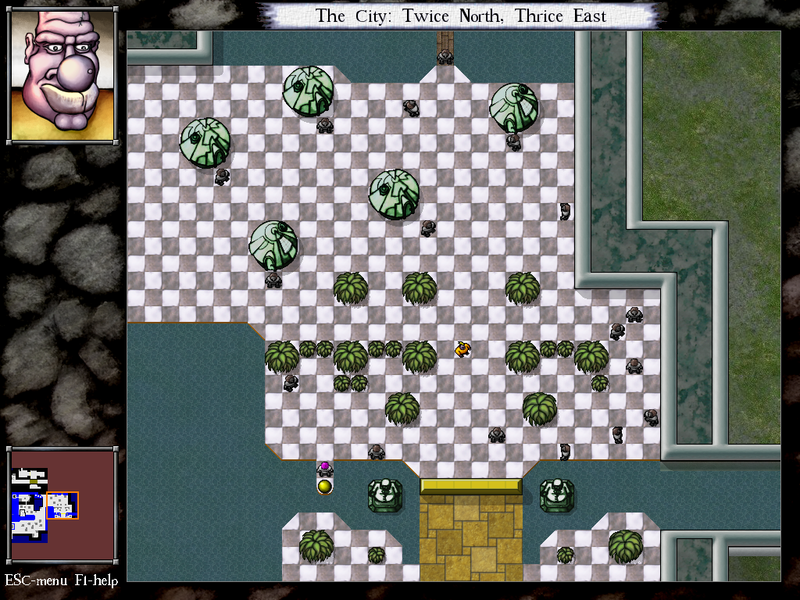 The basic way the game works, from the first episode onward, is that most levels introduce a new monster type or terrain feature and then exploit its puzzle potential in every imaginable way. 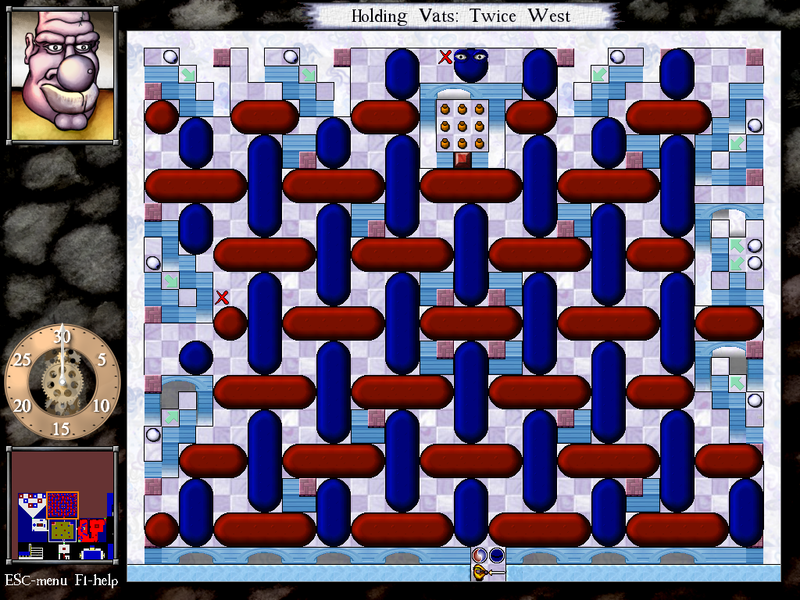 When its potential is exhausted, you proceed to the next level and get a new puzzle theme to explore exhaustively. 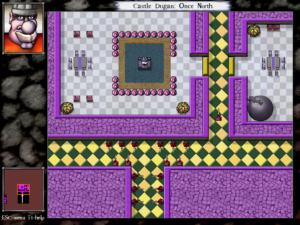 The first game had a simple storyline involving Beethro Budkin, dungeon exterminator, being hired to clear out the levels below the castle of one King Dugan. It left one hook for future adventures: one room had a door that could only be opened from the other side. The sequel, Journey to Rooted Hold, had Beethro getting through that door and discovering to his shock and surprise that the game had a plot. 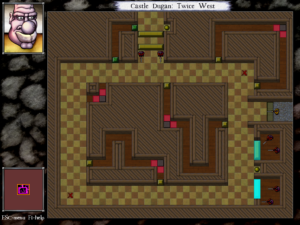 It seems that the accretion of additional levels to the bottom of Dugan’s dungeon in successive versions of the original game isn’t just a natural phenomenon, but the activity of an underground empire founded in the pursuit of knowledge — a hive of secrets, seemingly pointless activity, and endless bureaucracy. NPCs were introduced, Beethro’s nephew Halph (who assisted Beethro with some of the puzzles) started acting creepy and disappeared, a voice from a vast pit muttered cryptic nonsense. The City Beneath, the new episode, picks up where that left off, with Beethro arriving at the empire’s capital. The city is a hub of pure scenery and NPC interaction where Beethro isn’t even allowed to use his sword, with puzzle areas around its periphery. In a way, this hub section reminds me of Knytt, an experimental work that’s more art object than game. That’s the basics. More details will follow, when I’m not in a hurry to get back to playing it. This is a real 5 AM game. 1. ↑ Yes, it has to be capitalized like that. Be grateful I have enough self-control to refrain from adding a trademark symbol. Has it really been more than a week since my last post? Believe it or not, I haven’t abandoned the Oath. I just haven’t played any Stack games in the last week, owing to a confluence of (a) tax preparation, (b) nice weather, (c) the release of the new DROD demo (about which more soon), and (d) a certain amount of dread about continuing The Dark Crystal from where I left off, stuck near the end on one of those one-turn guess-right-or-die puzzles that plagued Time Zone. A nudge from a list of recognized verbs got me through that one, and the rest of the game was smooth sailing, aside from some more difficulties guessing the right commands to do things that I knew I needed to do. This game seemed to have that problem more than the other two games, perhaps because of the way that the necessary actions were chosen to fit a pre-existing story rather than designed to fit the game engine. The guess-the-verb problem is basically how most people remember text adventures. This may seem like an ignorant prejudice to a fan of modern IF, but it has its foundation in these older games. Especially the early illustrated games, where, as I’ve said, the emphasis in development was on the pictures rather than the gameplay, the story, or the prose. I keep being reminded of the ad campaign that Infocom ran in 1983, extolling the ability of prose to create more vivid images than graphics. Sierra’s games were a large part of the reason this was so convincing at the time. And yet, I think that if you wanted to make a better adaptation of the movie, the graphics, not the prose, is the main thing you’d have to improve here. The Dark Crystal is a more visual movie than many, and the Apple II is stretched to its limits just making a skeksis recognizable as a skeksis and a landstrider as a landstrider. It must have taken a great deal of work to get it even this far — creating graphics was a laborious process in the days before the mouse, and it looks to me like this game contains far more vectors per illustration than its predecessors. But even if you filled the game with still frames from the actual film at full cinema resolution, it would be less than satisfying: the puppeteer’s art is about movement. To really do this movie justice, you need animation. I understand that there’s a sequel to The Dark Crystal in the works. I’m not sure how I feel about that, especially with the original creators uninvolved, but I definitely look forward to the inevitable game based on it. May it be a better representation of Froud and Henson’s world than this one. I’ve reached the point in the story where Kira, the female lead, shows up. This makes all of the background illustrations different. They could have generalized the problem of adding another gelfling to all the pictures by overlaying an unvarying image of Kira on the same images, like they do with dropped objects. But they chose not to, and it’s probably a good thing. Unless the room graphics are very uniform in layout — which they’re not in this game — that approach frequently winds up displaying things floating in the air or in the middle of a river or something. I wonder again if the experiences gained in making this game led to King’s Quest, with its uniform perspective and sprite-based engine. Kira’s presence causes the landstriders, which have been present in one room thoughout the game, to suddenly become ridable, something I don’t think I’d have guessed without knowledge of the movie. The Dark Crystal follows the movie pretty closely. It inserts puzzles into the movie’s framework — for example, you have to solve a puzzle to find the double flute that Jen was playing in the movie’s first shot of him — but a significant amount of the game consists of simply replicating Jen’s actions from the movie. The whole thing would probably be bewildering to someone who hadn’t seen the original, but that’s really to be expected. It’s a rare adaptation that really stands on its own. But here, we have the additional handicap of lacking one crucial piece of the game designer’s art, one that hadn’t really been developed yet at this early juncture: cut scenes. Yes, cut scenes. Strange to think that there was a time before them, seeing what a simple idea they really are, but it wasn’t until the mid-to-late 1980s that they started showing up to any significant degree. It just wasn’t part of people’s idea of how games worked. And without some means of showing things that aren’t happening to the player character, this game has to leave out everything that goes on in the Skeksis castle before Jen gets there. That’s a big chunk of the plot. Instead, the Chamberlain, a major character in the film, just shows up in Jen’s path with no precedent or explanation, and disappears shortly thereafter.